An archive of Joe's past activities in the Qigong and wellness communities. I’ve been practicing Spring Forest Qigong since 1995 and have completed all four levels twice. I became certified to teach level one in January 2009 and have taught Qigong classes at Washburn Community Education, Present Moment, Powderhorn Park, and at the YWCA Midtown Minneapolis. I received master healers recognition from Spring Forest in October, 2009, and I have attended the emotions retreat, teacher training, master healer certificate training, and the Spring Forest Guild Retreat, all to deepen my understanding of this wonderful practice. I have volunteered with the Spring Forest Guild association, with Guild Reachout, and with healing through the Guild. If you are interested in taking a class or starting a class please contact me and we’ll get one going. After 6 classes you will be Level One certified. These classes ended in 2012. For info, call Joe at 612-232-0816, or use the contact form. This group ended in 2011. The 2011 Powderhorn Spring Forest Qigong Practice Group sessions will be held on the first Saturday of the month, from June through September, 10am – noon. The focus this summer will be on longer, active exercises. 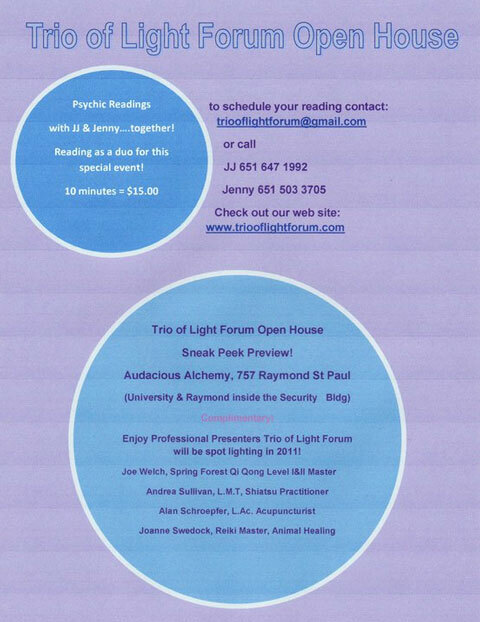 The Trio of Light Forum Open House, held in St. Paul on February 9, was a warm gathering of like-minded folks sharing their gifts. My contribution was sharing Spring Forest Qigong exercises and meditation. I look forward to more events like this in the future. This Open House was a preview of our upcoming Global Transformations event on March 26 at Unity South Church in Bloomington, Minnesota. Learn more about the Trio of Light Forum. DK Brainard is an intuitive astrologer and soul reader with clients on five continents. He specializes in helping clients work at the causal level of the mind and the archetypal level of the soul to transform the outer world. Why Emotional Intelligence is key to thriving in the coming era and how to develop yours. Assembling your team – preparedness, flexibility and community are keys to thriving. The two paths – Creativity and Beauty vs. Consumption and Violence. Take a look forward to 2020 & 2030 to see for yourself what is likely and why preparation of consciousness now is so vital. Together as a duo, JJ and Jenny will channel Live Healing Messages of Love from Specific Assented Masters, regarding some of the energetic changes and shifts we are experiencing right now! In addition JJ & Jenny will offer information and insight, answering some of your questions about the transformational times on the planet in 2011 & 2012! This dynamic pair has been receiving messages from Spirit for months, driven to coordinate this special event to provide you with clarity and proactive methods of making a positive healing difference! 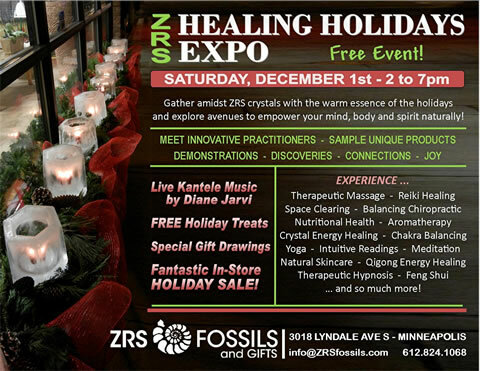 Joe will present healing tools you can implement to assist you in healing and shifting energy! How to better your health, mentality, phsyical body, emotions and spirituality. Joe has fifteen years of practice doing Spring Forest Qigong with an intent to spread Master Chun Yi Lin’s message of Love, Kindness, Forgiveness and that we are ALL born a healer!